We are fully committed to developing our people, promoting lifelong learning and giving each person the opportunity to grow. We work with some of the best known hotel brands in the world which creates fabulous opportunities for our people. We are incredibly proud of our previous partnerships, raising £142,698 for Make-A-Wish® UK over the last 3 years and £76,553 for NSPCC over the last 2 years. We also encourage a programme of initiatives across our hotels and offices to support local communities, by contributing to food banks, going into schools and colleges to promote careers in hospitality, and fundraising for local charity groups. Our Tree of Life programme ensures that the health and wellbeing of all of our employees is a key focus at all times. All of our hotels and offices have commitments in place to ensure they are making a difference under the Active Body, Social, Mindfulness and Nutrition branches of the programme. This focus leads to a happier and healthier workforce and a better place to work for all of our team. We have a key focus on understanding and embracing all of the cultures of our people to ensure better ideas and discussions occur that benefit everyone and drive inclusion and engagement. 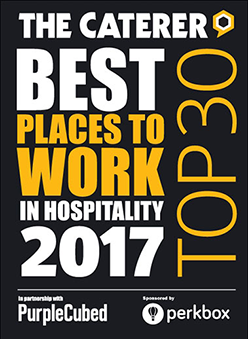 We want to be recognised as one of the best places to work to ensure our team are all fully engaged in delivering excpetional service.